Cooper's hawks spend much of their time perched or preening. 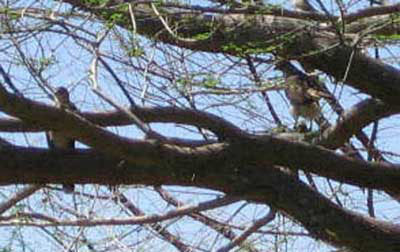 The male hawk keeps his distance from his mate unless he has an invitation. 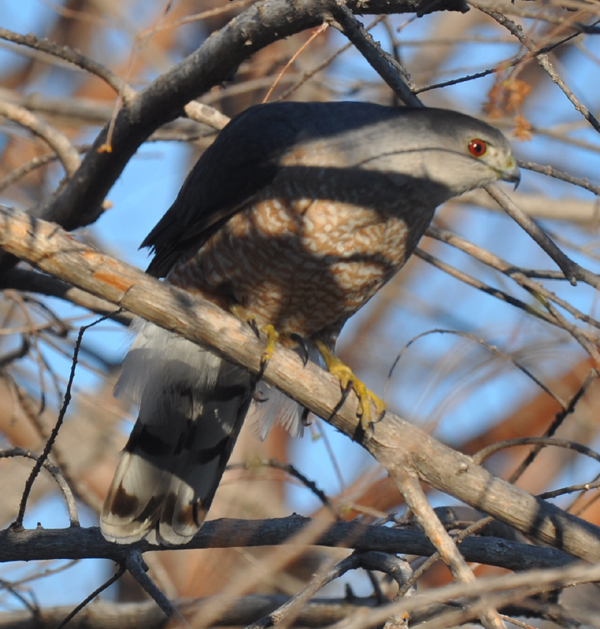 Little is known about the Cooper’s hawk’s behavior outside of the breeding season. However, he is not known to be a social bird, and there is no evidence that a pair spends time together during the fall and winter seasons. 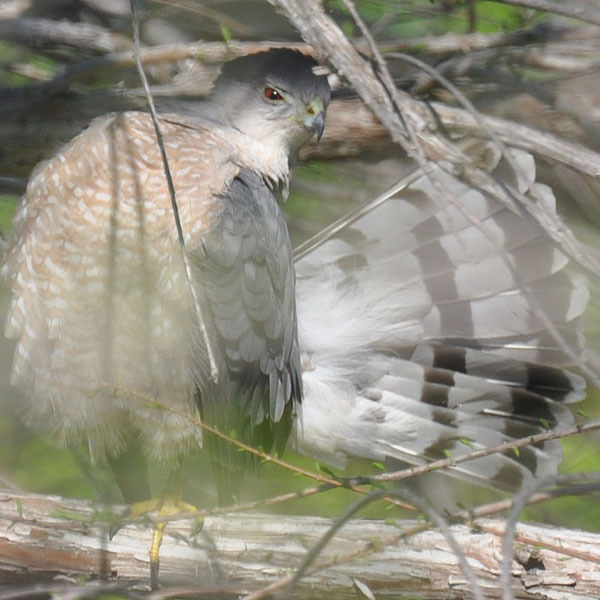 As do most raptors, Cooper’s hawks spend most of their time perched and preening or hunting, moving from one place to another to better their hunting success. 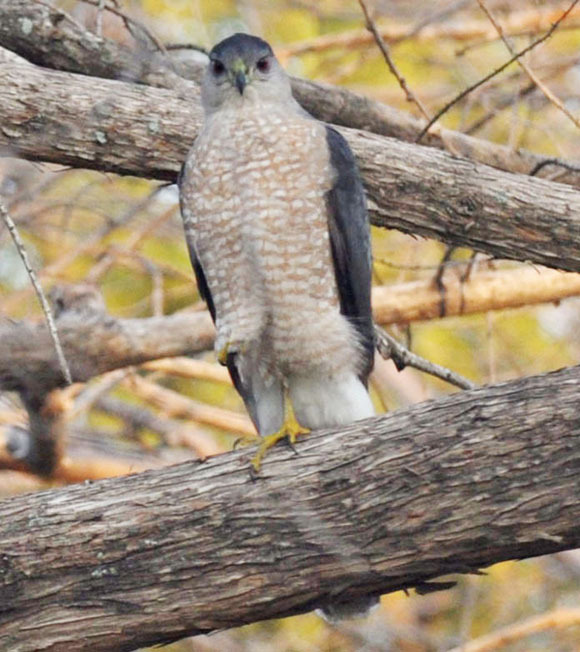 Cooper’s hawks often perch on one foot, with the other foot pulled up into the breast feathers. They always roost on one foot, with head tucked into the feathers of the back. Some say the hawk changes foot positions every so often without awakening. 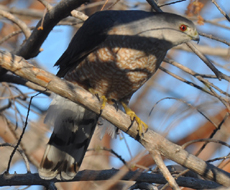 Cooper’s hawks are monogamous, but if something happens to one, the lone hawk will seek another mate. The female is dominant, and the male hawk defers to his mate, keeping his distance from her whenever possible. During the mating season, he will usually gift her with prey and wait for an invitation before approaching her. When she is ready, she will vocalize and get into the right position for him; after mating, the male side-steps or flies quickly away. Since the average male is only around 60% of the size of his mate, and keeping in mind that her favorite prey is a bird about his size, it seems wise for him to treat her with respect. The male provides almost all of the food for his mate during incubation and brooding times, delivering the prey to a place near the nest, perhaps a plucking station or old nest. He will incubate the eggs while the female eats, but rarely approaches the nest while she is brooding her nestlings. On those rare occasions when he delivers prey directly to the nest, he drops it and makes a rapid retreat. Once the young have begun to leave the nest, the male begins to frequent the nest again, bringing prey to the fledglings. Cooper’s hawks do not require water to drink, as they get all the fluids they need from their prey. That is not to say that they don’t enjoy a swim, however. Juveniles especially seem attracted to flowing water, and will bathe, dipping head and then body and tail under the water, rousing with vigor. This is often followed by a sunbath and preening on a nearby branch.